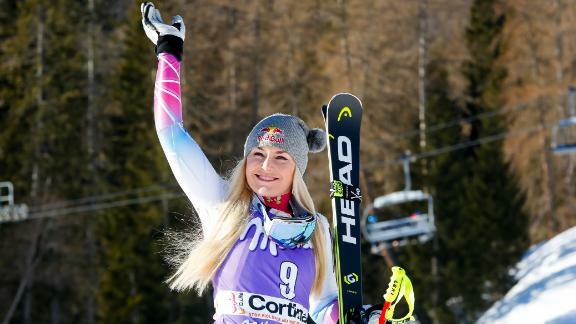 Lindsey Vonn has finally had to admit defeat. The American ski star has made the decision she was dreading, and will retire after the World Championships in Are, Sweden later this month. The 34-year-old has enjoyed a glittering career and compiled a remarkable 82 World Cup victories to sit second on the all-time list behind Sweden's Ingemar Stenmark. She has bounced back from serious injury multiple times, but the knee problem that has plagued her in recent years has forced her to bring forward her planned retirement at the end of the season. "The past two weeks have been some of the most emotionally challenging days of my life," Vonn wrote on Facebook. "I am struggling with the reality of what my body is telling me versus what my mind and heart believe I'm capable of. The unfortunate reality is my mind and body are not on the same page. After many sleepless nights, I have finally accepted that I cannot continue ski racing." She added: "My body is broken beyond repair and it isn't letting me have the final season I dreamed of. My body is screaming at me to STOP and it's time for me to listen." Vonn, the 2010 Olympic downhill champion and two-time bronze medalist, will compete in the super-G on February 5 and downhill on February 10 in Sweden before exiting the sport she has graced at the top level since her debut as a 17-year-old in 2002. Since then she has become one of the most decorated skiers of all time, winning 20 season titles in various disciplines including four World Cup overall crowns. She was a double world champion in downhill and super-G in 2009, and though knee injury deprived her of the chance to defend her Olympic downhill title in Sochi in 2014, she bounced back to clinch downhill bronze in her final Olympics in Pyeongchang last year. The speed specialist announced last autumn this was to be her final season, but a knee injury in a pre-season training crash at Copper Mountain, Co. forced her to miss her beloved Lake Louise event at the end of November and she announced she would return to the Canadian venue for one final appearance at the end of the year. However, she experienced knee pain when she made a belated season debut at Cortina d'Ampezzo in Italy in January, and admitted then she might have to bring her retirement plans forward. "Over the past few years I have had more injuries and surgeries than I care to admit," she added on Facebook. "A large portion of cartilage that had delaminated from my bone was removed. My crash in Lake Louise last year was much more painful than I let on, but I continued to race because I wanted to win a medal in the Olympics for my late grandfather. Again, I rehabbed my way back this summer and I felt better than I had in a long time." Vonn revealed that she tore ligaments in her left knee and sustained three fractures in the training crash at Copper Mountain. "Despite extensive therapy, training and a knee brace, I am not able make the turns necessary to compete the way I know I can," she wrote. In an exclusive interview with CNN ahead of the race in Cortina, Vonn admitted she was worried about the onset of arthritis and being able to ski with her future children one day. But she said what rankles is falling short of Stenmark's record. "Honestly, retiring isn't what upsets me," she added. "Retiring without reaching my goal is what will stay with me forever. However, I can look back at 82 World Cup wins, 20 World Cup titles, 3 Olympic medals, 7 World Championship medals and say that I have accomplished something that no other woman in HISTORY has ever done, and that is something that I will be proud of FOREVER! "So please let my story be of comebacks, victories and even injuries, but do not tell my story as one of failures or unreached goals."